Your tires are an important component of your vehicle, making it vital that you have a tire repair service shop you can rely upon. But do you really understand what it is that your tires and wheels do? Yes, they serve as the point of contact between your vehicle and the road, but they are also what propels your vehicle down it. Your engine supplies the power, yet how much is needed depends upon the resistive force generated between your tire and the road surface as well as the weight of your vehicle. To drive, your engine must produce enough power to overcome this friction. That power is manifested in the rotational force of your wheels, which then uses the tires to apply it to the road surface. 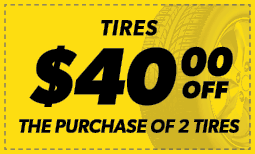 To learn more about how tires work, visit Meineke #520 in Amherst, NY. The question of "why are tires so important?" typically comes up when the need for a tire repair shop arises. It is a question that deserves some thought. Nearly every aspect of your vehicle's performance, including braking, acceleration, steering, traction, and handling, are all largely dependent on tire performance. Issues with the tread, balance, or stability of your tires and wheels could affect your control of your vehicle in an emergency situation. Thus, if you suspect any problems, you should visit Meineke #520 in Amherst, NY for repair or tire change service right away. If you have older or damaged tires, you may be wondering about potential warning signs. Fortunately for drivers, many of these signs are easily observable to the naked eye. If you notice that your tires are punctured or cracked, it may be time to consider taking your vehicle to a tire change service provider. If your pressure sensor constantly gives low readings, even after you fill your tires with air or change them, your car may need to undergo tire pressure sensor replacement. Many of these issues are signs of severe damage, so call our Amherst, NY, Meineke #520 location if you notice any of them. A flat tire leaves you stranded, pure and simple. Yet there are other reasons why you should ask yourself "Is there a good option for tire repair near me?" long before you ever get a flat. Avoiding routine tire rotations won't necessarily keep your vehicle from driving (up until excessive wear causes a flat, that is), yet it does limit their performance lifetime. Given the significant financial investment your tires represent, wouldn't you want to get the most out of them? Contact us at Meineke #520 in Amherst, NY to learn how a low tire rotation can save you hundreds of dollars in the long run. The great thing about tires is that they usually show clear signs when they need to be replaced or serviced. Damaged side walls may be cracked and broken if the tire is old or failing. Tread on the tire may also seem noticeably low, further indicating the need for a tire repair service. In severe cases, your tires may be so damaged, you can feel or see the belts, or insides, of the tire. Wear on one side, or not enough wear along both sides of your tire also indicates a problem. If any of these happen to your vehicle, immediately contact Meineke #520 in Amherst, NY to help you safely get back on the road. At Meineke, we understand that you may be concerned about tire rotation or tire repair cost. If you are, we offer a variety of tire rotation coupons that can help you save on these services. Our professionals always provide quality service. If you believe that your tires are old or damaged, don't hesitate to contact one of our professionals at the Amherst NY Meineke #520 today.